Archaeological Tourism Blog: Who built Puma Punku in one night? Archaeological tourism blog and tips. Who built Puma Punku in one night? Only the Inca people knows who built Puma Punku in one night. But their statement is incredible. They say gods built Puma Punku in one night and not the Inca or their ancestors. 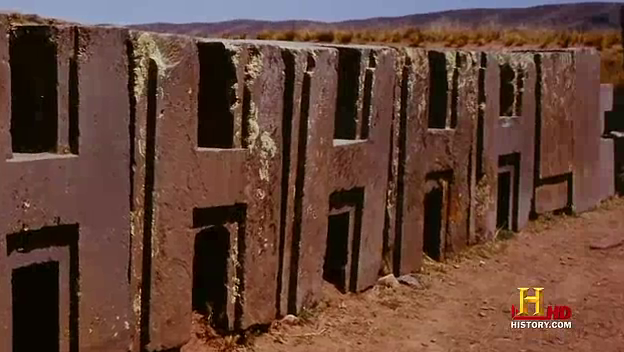 To build in one night a lot of blocks of stone like those in Puma Punku is like building an amazing puzzle. Or, perhaps, this is the riddle about the place. Lots of identical structures made of diorite, which cannot be cut by any ancient tools! The hardness of diorite is 8 of 10 and can be cut only by diamond. The inhabitants are talking about a god called Viracocha. The name of this god believed to have built Puma Punku in Bolivia in one night means sea foam. Other scholars believe that he is, in fact, the one who came from a vulcano as his name suggests. Yet, we are talking about incredible, huge structures built as though a mobile modern factory was there. But Puma Punku is not only what we see in this picture taken from History! The nearby Tiahuanaku could have been reconstructed. Puma Punku has not got that chance simply because we found here structures that cannot be moved for they are too heavy. Our technology doesn't allow this. So, who could have built this place in one night? Recently we found out that a Chinese company can build houses in only 2 hours. They are using 3D printers. This might be an explanation which can change history. Take a look at this video. A pre-Columbian civilization which is believed to have built Puma Punku in one night couldn't have 3D Printers 17.000 years ago. Or it could? On the other hand, such a civilization, let's say Aymara couldn't have carry huge blocks of stone of hudreds tons more than 60 km where the closest mine is. So, who built Puma Punku in one night if this is true? Might this new Chinese technology be the answer? And if this is the answer this means we deal with an ancient civilization which had our tools and which misteriously vanished. See also how the weather is at Puma Punku in Bolivia and when to visit the place! You may also want to read about the River Styxx - I have been there in July 2014. See 10 things you didn't know about the Great Pyramid in Egypt! Vizitează profilul lui Jim pe Pinterest. Join our journey to incredible destinations all around the world. Mobile guide for tourists!